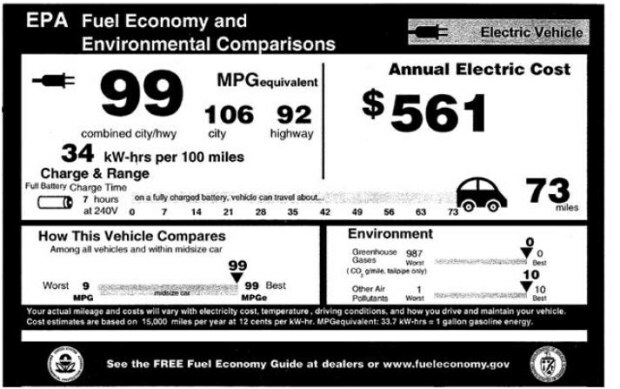 While I’m sure the guys at Nissan were crossing their fingers, hoping for a 100MPGe rating, the EPA either had other ideas, or didn’t plan for three-digit numbers on their window stickers. Maybe the new ones will change that, but for now the poor Leaf is stuck with a paltry 99MPGe rating. Wait, that’s pretty good. The 99MPGe actually makes it the best in its class (mid-size vehicles) for fuel economy and environmental concerns. Not that it’s really a big surprise… its competition isn’t exactly, you know, electric. It’ll have more to contend with once Toyota, Honda, Tesla, Mitsubishi, all the other guys get their mid-size vehicles out. I’m looking forward to 2012, and not just because of the armageddon thing!